In this project, we’re building a Single Chip FM Radio. The heart of this circuit is a digital IC – TDA7000. The design involves proper use of inductors and capacitors with correct values. Since the IC is dedicated to build radio circuits, this circuit is very much reliable to an extent. Here is a compact low cost FM radio circuit using IC TDA 7000. This circuit is designed as per the data sheet and the result is excellent.Ideal for all category of electronic enthusiasts. The TDA7000 is a monolithic integrated circuit for mono FM portable radios, where a minimum on peripheral components is crucial. The IC TDA 7000 has a Frequency-Locked-Loop system with an intermediate frequency of 70 kHz. The intermediate frequency selectivity is achieved by active RC filters. The only function which needs alignment is the resonant circuit for the oscillator, thus selecting the reception frequency. Spurious reception is avoided by means of a mute circuit, which also eliminates too noisy input signals. Special steps are taken to meet the radiation requirements. FM Radio Circuit Diagram with Parts List. For L1 and L2 wind 5 turns of 0.6 mm enameled Copper wire on a 4 mm dia plastic former. For antenna use a 50mm long insulated copper wire. 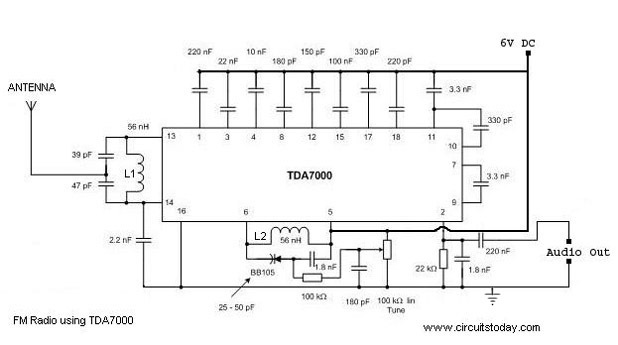 IC TDA 7000 can withstand up to 10 V supply voltage.But I recommend 6V. Use an 8 Ohm speaker or Headphone at the audio output. IC based FM receiver, IC based Am receiver, IC based FM transmitter. So, sir plz send me nice & simple circuit diagram of fm reciver which has internaly having tuning circuit…. I appreciate for many electronics circuit, all are very useful especially for me, and for others. thanks. I have plan to launch a radio station of my own. Learned from this rich article. Thanks author for sharing us. should we use PCB board or bread board for the connections? how many days are required for the completion of this project? can an individual perform it as the first project? Hi Greeshma you have to use the PCB shown in the application datasheet of the manufacturer. If you have all components on hand with good solering iron and lead you can finish the project in 4 to 5 hrs(if you are good at soldering) If you are a beginner use only discrete component projects using simple transistors before starting with multi-pin ICs. sir im ece second year student studying in kec. i want an interesting and useul mini project title at less cost. i have to submitt my project b4 this month so help me sir……. is TDA7000 is available in India??? what if i use a cxa1619bs ic?? should i just follow the circuit?? Yes Joey you can use Sony CXA1619BS it is a very good chip and freely available in the spare market. Use the recommended PCB shown in Sony application datasheet. For anyone who still searches the TDA7000: it isnÂ´t obsolete! TCA440 for sale, around 10 Euros. Hi Rohit please go through Sony Data sheet. Recommended operation is only 9 volt. 14 volt is absolute maximum hence not recommended. I have used it from 3 to 9 volt without any difficulty or deterioration in performance except maximum available volume level. I have heard the IC CXA1619BS (Sony)is a very good chip for FM radio circuits, is it possible to have a circuit around this IC, it is suitable for about 14 volts, hence with this circuit it can always be fitted in a car. how to select the desired channel frequency?? commercial radios start from 87.5Mhz to 108Mhz. how do i improve this design to get to that range? use bigger value of variable capacitor? The sony 1c u toked of has more dan 30pins n dis pins are stacked 2geda…cant even fit in a PCB…you knw of any Fm schematic using dis sony cx1916bs.. THE tda 7000 can power a 8ohms speaker,i used Lm386l audio amp 2 do d amplification,unfortunating yet tune in2 a station,where is d prob 4m?,4m d varicap diode,or d coil? But i can hear d rushing noise just as every normal radio, pls i nid help? i can’t find where to give negative and positive terminal of the DC current. Please help me. I love electronics,in my childhood i was make little electronic project.after see this website i remember my child hood. Hi Dayal and Sunil the IC is very rare now. instead you can use Sony CXA1619BS chip which is very common, economical and very good. works down to 2.4volt. you can refer my earlier communication on this on 18th March. can you give me a sampleâ€¦regarding the TDA7000 circuit aboveâ€¦? this circuit is good enough but i also see some chinies circuits which uses 3 volt power supply for the fm receiver circuits. so i am requesting you all to please search this type of circuit which is energy efficient. sir how can i change the frequency of reciever? is it by changing the rheostat? hi raju you can try Sony CXA1619BS which is available freely in India. salo ic milti nahi hai (TDA7000). Can this chip with a few external components btpass the FM demodulator and demodulate an AM or CW or DSB/USB/LSB Signal?? Seems like there is an output pin where the IF signal is avAilable Pin 12 (i.f. filter) or 16 (i.f. limiter)of this chip. I want to use this for Aircraft frequencies 110-137mhz which broadcast AM only. Unfortunatelly, TDA7000 is obsolete and hard to find. There was one schematic with TDA7000 and TDA7052 – perfect little radio. Someone mentioned CXA1619, which is even more obsolete. Do anyone know any new circuit ? Hi friends any one can give circuits regarding mobile phone. As iam student of electronics and iam very much interested in mobile and radio circuit making i want some mobile circuits. Plz help me to do some projects on mobile communication. I hope that all of you help me. Guys I want to build a FM transmitter whose input is from any USB device like Flsh Drive(Pen drive) OR MMC Card reader. hai sree, Sony CXA1619BS is the best FM radio chip with all necessary circuits including amplifier to drive speaker. this chip works from 14 volt down to 3 volt. performance of this chip is also great and economical. no special coils and ifts are required. std components are used. very easy to assemble. enjoy. see the enclosed web site. Good site.tda 7000 are seems to be obsolete now a days ,can you have any replacement for it ?? is there another number can use it? Please send to me some circuits diagram for students and bigginer,or do it-yourself circuit,literatures,brochure,catalogs and servives to the address below. please tell me simple circuit for radio…. there are many radio circuits in the Radio Circuits section. i have no money to buy these components for expriment but i have very intrest in electronics. hi,i need a circuit equivalent to an antenna so that i don’t have to use an antenna in an fm transmitter.thanks,waiting very eagerly!!! can the spools be replaced by ordinary spools that you can buy in a radioshack? my shack has various. If the diameter, length and material of the spool are same then OK.
am an electronic student.i want to make a home inverter.can u help me? Thanks, this helped for my electronics coursework!! Cheers! hey man there is a problem with de potentiometer how is posible that the potentiometer is conected with the possitive and the ground of the source voltage? author: please take a close look.A POT as high as 100K is used here.it is the fixed ends of the POT that are connected between positive and ground.At any condition the resistance between positive and ground will be 100K.This is almost equal to an open circuit.There is no chance of a short. Audio output will not drive headphones or speakers as stated. Further amplification is required as the TDA7000 has an output of only 75mVrms into the 22K load. The supply needs to regulated where varicap tuning is used. ok,but vcc max 2.5 vDC !!!! 6 VDC burn out man….